The R-PLEX Human S100A8/MRP8 Antibody Set includes a matched capture and detection antibody pair and calibrator for the quick and easy measurement of S100A8 in biological samples. R-PLEX products leverage MSD’s electrochemiluminescence technology for better sensitivity and a larger dynamic range than traditional ELISAs. R-PLEX matched antibody sets enable the development of singleplex and multiplex immunoassays. Individual assays may be developed using MSD avidin- or streptavidin-coated plates. Custom multiplex assays with any combination of R-PLEX analytes, as well as R-PLEX plus U-PLEX analytes can be developed on U-PLEX MULTI-SPOT plates. To learn more about the advantages of R-PLEX products click here. 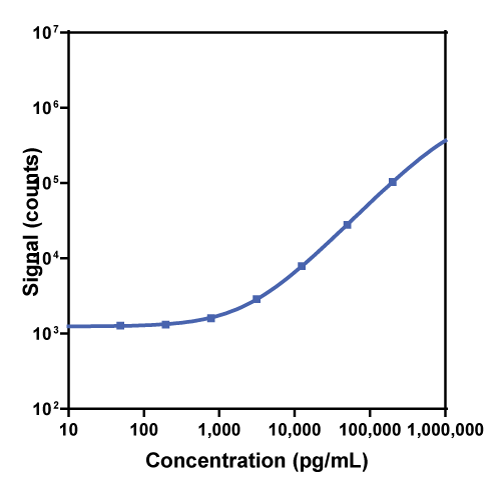 Calibration curve for the R-PLEX Human S100A8/MRP8 Antibody Set was assessed and representative data is presented below. Description - S100A8 (P8, MIF, NIF, CAGA, CFAG, CGLA, L1Ag, MRP8, CP-10, MA387, 60B8AG, S100A8, Calgranulin A, calcium binding protein A8) is a 10 kDa protein and a member of the S100 family of calcium sensing proteins. They are involved in regulating many cellular processes such as cell cycle progression and cellular differentiation. S100A8 may function in the inhibition of casein kinase, and as a cytokine. Altered expression of this protein is associated with cystic fibrosis. S100A8 is predominantly found as calprotectin (S100A8/A9) which is involved with many intra- and extracellular functions and can induce neutrophil chemotaxis and adhesion.